taib, don’t let the sarawakians suffer! – welcome! You are here: Home › election › taib, don’t let the sarawakians suffer! 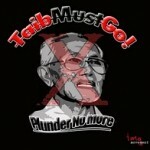 taib, don’t let the sarawakians suffer! reference my post yesterday on the white hair devil, here’s a song you should sing and encourage/promote others to sing it. oh the song is in bahasa. there is also a chinese version. sarawak election – kick the white-hair devil out! 2 Responses to "taib, don’t let the sarawakians suffer!" After 40 years of milking Sarawak, now that white hair shark want to pledge to make Sarawak the richest state? You have made yourself so much richer than the state of Sarawak. You have put yourself before the interest of the people of Sarawak and made yourself a multi-billionaire. You have built a regime around you and now you are feeling guilty and want to redeem yourself and your family and cronies? Let’s say you are sincere. Would anyone in the right mind believe you? You are admitting now that all this while you have robbed the riches of Sarawak totally for yourself. Let’s begin with the over 10 reports that have been made with the MACC to investigate Taib Mahmud. People Power: BN wants to make Sarawak the richest by 2020? Why was this not done earlier? What has the BN been doing all this while? Sleeping? Now you want to do it in 10 years when you have failed to do so after 40 years but instead have been robbing the natives of their rightful inheritance? You think we Sarawakians are stupid enough to believe you can do it in the next 10 years?